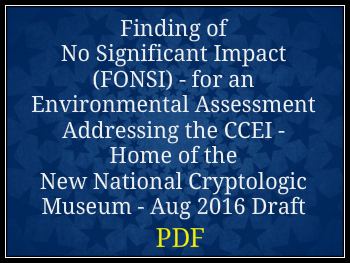 Environmental Assessment Addressing the CCEI-Home of New National Cryptologic Museum and Finding of No Significant Impact. 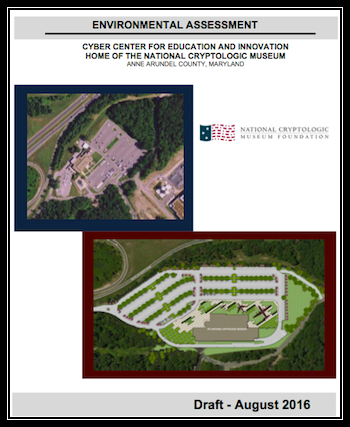 The Foundation’s Cyber Center For Education and Innovation (CCEI) – Home of the National Cryptologic Museum (NCM) project recently achieved a significant milestone by releasing the project’s Environmental Assessment (EA) and the associated Finding of No Significant Impact (FONSI) for public and regulatory agency review and comment. An EA is required as the CCEI/NCM will be built on federal property within NSA’s Exclusive Use Area on Fort Meade. The purpose of the public and regulatory agency review is to determine if those entities concur with the EA’s conclusions that the project will not have a significant impact on the quality of the human and natural environment in the surrounding area. 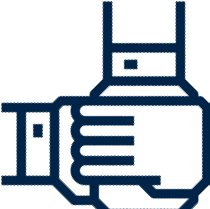 The comment period closed in early September 2016 and the final EA incorporating the reviewer’s responses was published later that month. Please click on either of the images below to view the full PDF for each document. 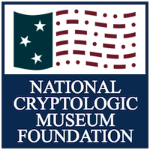 Did you know that captured Axis cryptographic equipment became the basis for a small and little known Research and Development Museum collection that was the NCM’s precursor?